2017. AN INTERVIEW WITH WRITER RAFFAELE LAURO ON THE EDITORIAL NEWS FOR THE NEW YEAR AFTER THE SUCCESS OF “THE SORRENTINE TRILOGY”. 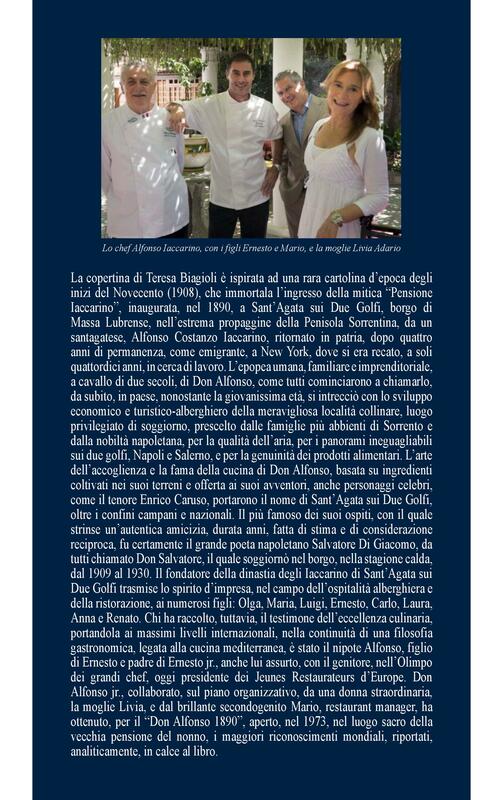 A NEW NOVEL TO BE PUBLISHED IN LATE SPRING, ENTITLED “DON ALFONSO 1890 - SALVATORE DI GIACOMO AND SANT’AGATA SUI DUE GOLFI”, DEDICATED TO THE ENTREPRENEURIAL AND GASTRONOMIC EPOS OF ALFONSO COSTANZO IACCARINO AND THE INTERNATIONAL EPOS OF HIS MULTISTARRED GRANDSON, ALFONSO IACCARINO. THE PREMIÈRE OF THE COVER OF THE NEW WORK. 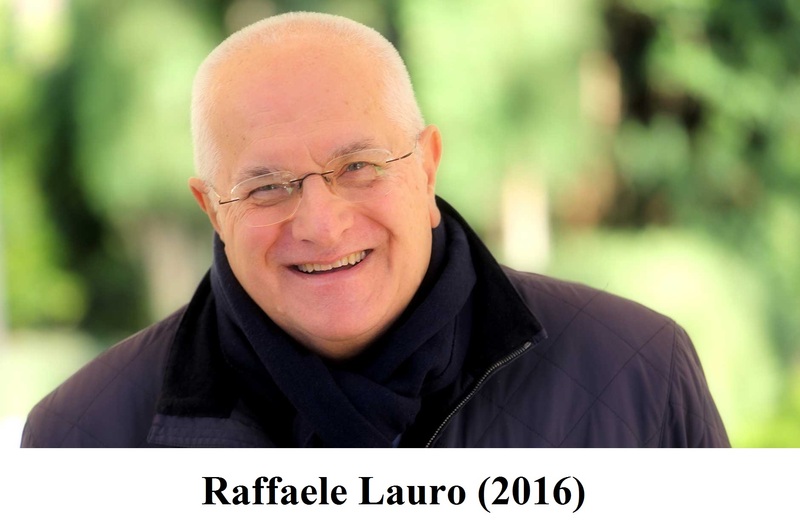 At the beginning of the year we traditionally interviewed the Sorrentine writer Raffaele Lauro, who after a long stay in London spent the Christmas and New Year holiday in Rome, and after the extraordinary success of “The Sorrentine Trilogy”tells us the cultural and editorial news for 2017. D.: For two months you have been quite silent to those who follow and respect you, both at national level as well as in Sorrento and the Sorrentine Peninsula. Some say of your detachment from our coast, to which you’ve dedicated three enthusiastic and celebratory novels that will remain in the cultural and tourism history of the Siren Land. R.: No detachment whatsoever. On the contrary. A writer cannot become a robot, a machine. They need inspiration and reflection to avoid falling into the always lurking banality. In fact, I was in London to attend meetings with London publishers interested in publishing “The Sorrentine Trilogy” in English for the benefit of generations of the past, present and future English-speaking guests who love our beautiful land. I had some offers, but I will make decisions after the response from the Sorrento Foundation on the publishing project of a pocket-book in English with the most beautiful pages of the trilogy, on Sorrento, Massa Lubrense, Sant’Agnello, Piano di Sorrento, Meta, Vico Equense and Capri, to offer a free copy to tourists, also in digital format, via the corporate websites of the Foundation, of hotels and peninsula municipalities participating in a promotional initiative for customer satisfaction, that is, how to improve the quality of services through recognising the needs and satisfaction of the English-speaking clientèle. The first culturally mediated monitoring experiment. D.: An excellent and modern idea open to the new media, which we already discussed in the past, and which has been re-mentioned recently in Piano di Sorrento by journalist Fabrizio D’Esposito. What is the timeframe? R.: It will depend on the assessments of the Foundation, chaired authoritatively by Commander Gianluigi Aponte and managed by solicitor Gaetano Milano. I trust also in the interest raised by the initiative in the Mayor of Sorrento, Giuseppe Cuomo. If the decision is set in place before the end of January, the project could be operational as early as the summer 2017 season. The time needed for translation, editing and the related promotional campaign. If not, I will proceed with one of the London projects, or I will turn privately to some friends, restaurateurs and hoteliers in Sorrento, who have always supported my cultural initiatives with intelligent generosity, aimed at the international promotion of the image of Sorrento in a non-provincial key. D.: Apart from this brilliant initiative regarding what’s already written, what else is boiling in you “pan” for 2017 on the cultural and editorial level? On the cultural level, as already announced, I will be in Sorrento on 21st January to present the best-seller by Fiorella Donati, entitled “Beauty Coach”, a non purely scientific manual on aesthetic and recostructive plastic surgery, published by Sonzogno Editori, presented with great success in Milan, Mantova and Naples. A meritorious initiative by the municipal administration of Sorrento. Doctor Donati, Fiorella to me, represents the “glory” of our land, because she has established herself thanks to her will on an international level. I say this with friendly pride. I hope, for this reason, for a big public attendance to celebrate her. Later, in the spring, I will attend a general assembly at the Salvemini High School of Sorrento, during which the students will discuss my latest novel, “Dance The Love - A Star in Vico Equense”, dedicated to the Russian dancer Violetta Elvin, born Prokhorova, as part of a musical, singing and dancing performance organized by teachers and students. As it happened at the meeting for Lucio Dalla, an excellent educational and informational performance, which truly moved me. D.: And on the editorial level? 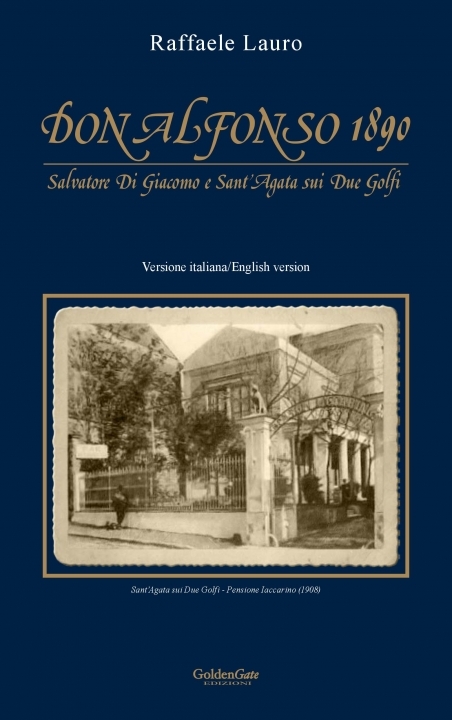 R.: A bilingual, Italian and English version of my new novel, “Don Alfonso 1890 - Salvatore Di Giacomo and Sant’Agata sui Due Golfi”, dedicated to the entrepreneurial and gastronomic epos of Alfonso Costanzo Iaccarino, the founder of the hotelier dynasty of the Iaccarino, and to the international fame of his grandson, a multistarred chef, Alfonso Iaccarino, will be published in late spring 2017. The co-protagonists of this epos will be the famous figures of the classical Neapolitan song, lyrics, culture and politics linked to Alfonso Costanzo, to Pensione Iaccarino and to Sant’Agata sui Due Golfi, as well as Agerola: Enrico Caruso, Salvatore Di Giacomo, Francesco Cilea, Roberto Bracco, ministers, writers and poets, such as Norman Douglas and the Sorrentine, Saltovar. In the second part of the novel, the stage will be filled with the admirers of his grandson, Alfonso, and his wife Livia: my brother Nello, the presidents of the Republic, Francesco Cossiga and Carlo Azeglio Ciampi, the legendary Lucio Dalla and the famous French singer Mireille Mattieu. To name a few. D.: It is a very impressive work. How did you gather information? My narrative invention of strict Manzonian imprint is based, as always, on a solid historical documentation (publications of the history of the land, of Sant’Agata and Agerola, unpublished letters, vintage photo collections, reference books on historical figures, memorials, publications and, in particular, direct testimonies). The documentary research of Riccardo Piroddi, Salvatore Di Giacomo, at the Lucchesi Palli section of the National Library of Naples, the direct testimony of the Mayor of Agerola, Luca Mascolo, the precious testimonies of Alfonso and Livia Iaccarino, Donato Iaccarino, Stefano Ruocco, Luigi Poi, Lello Ravenna and Antonino Siniscalchi were of great help. The emigration of the young Alfonso Costanzo to America at the age of only fourteen, alone, in search of work, allowed me to frame in economic, social and psychological terms the late nineteenth century Italian emigration and the origins of the Southern Question. The love of the also female Santagatesi for hunting quail gave me indirect means to analyse for the first time the economic development of the village from the nineteenth to the twentieth century, and to exalt popular dishes of the Sant’Agata cuisine: for example thrush broth to wean newborn babies! Cuisine as an expression of popular culture. D.: Why did you choose this particular dynasty, the Iaccarino, and not one of other families, who have also contributed a lot to the economic and tourist development of Sorrento and the Sorrentine Peninsula? R.: Don Alfonso Iaccarino is now a world figure and his gastronomic history reaches a long time ago, it is not an improvised affair like many others. A history that is intertwined closely with that of a unique place, such as Sant’Agata sui Due Golfi, and of a remarkable community, to which I am very grateful. The magical estate “The Peracciole”, at Punta della Campanella, with a fantastic view of Capri, the most beautiful view in the world, is not a trick, nor an affectation, but it expresses the essence of the gastronomic philosophy of Don Alfonso, the Mediterranean cuisine directly inherited from his grandfather, Alfonso Costanzo, that will be passed on to his children, Ernesto and Mario. My choice, therefore, was also affected by feelings: firstly, the fraternal friendship with Alfonso and his wife Livia, preceded by the friendship with my brother Nello. We love each other. This matters a lot to me. They have always supported me. I am pleased, therefore, to be able to raise with this exciting work a literary monument of personal and collective gratitude to the dynasty of Iaccarino, to Salvatore Di Giacomo and to Sant’Agata sui Due Golfi. D.: The Iaccarino dynasty is not the only family worthy of such historical and cultural attention. Are we witnessing the onset of a wide collection of coastal entrepreneurial figures? From commemorating places, are you moving on to commemorating the figures of Sorrento’s economy and tourism? R.: If only I had the strength and time (I would need at least two more lives! ), I would devote myself to this ambitious project: dynasties of the Sorrentine economy. Extraordinary men and women, who often moved from a hotel job, as employees, to running a hospitality business; from kitchen porters to famous restaurateurs. The list would be very long. Wonderful stories of sacrifice, work, passion, determination, success and creativity, the real wealth together with the workers of the sector in Sorrento and the Sorrentine Peninsula: the Manniello, the Russo, the Fiorentino, the Acampora, the Apreda, the Colonna, the Jannuzzi, the Di Leva, the Pane, the Savarese, the Aponte, the Cuomo, the Maresca and many others. There are figures of truly exemplary women: I affectionately remember among others Donna Maria Russo, the unforgettable mother of Mariano, Anna, Pupa and Giovanni Russo. I would like, however, at least to be able to write about the figures like Don Peppino Manniello, Don Martino Di Leva and Don Antonino Stinga. Three people, among others, very dear to me. In terms of the first two, who have already passed away, I admired their simplicity combined with creativity. Don Antonino Stinga continues to amaze me with his concreteness and industriousness. D.: You would need three lives, not two! Can we move on to the politics, of which you haven’t spoken since a year ago, when you joined the Democratic Party? Has Renzi perhaps imposed press silence on you? Has he put a muzzle on you? No parliamentarian, for example, has exposed more in the Parliament than you did, like the gambling scandal, while your enemies from the corrupt lobby go to jail! Don’t you feel the duty to stand again and continue your battle? Do you root for early elections, like Renzi, or do you want to postpone them, like Berlusconi? What is your judgement on Grillo and the 5S movement? What do you think of the many aspirations for parliamentary candidates that emerge in the Sorrento Coast? R.: This is not a question, rather a burst of questions, to which I could not give an answer in just a few words. I promise you, however, after a year of silence, the second short interview on political, international, national and local perspectives, without hiding anything and without too much diplomacy. I can only assure you that, as of now, no one has ever dared to impose a stop on my ideal battles and no one will ever dare to do it. D.: I take your word for it then! Politics without hiding anything! Happy 2017 and enjoy your work!